PUEBLO, Colo. – Two-time World Champion and Team USA Eagles head coach Justin McBride was chatting with his assistant coach and 2002 World Finals event winner J.W. Hart Sunday afternoon about what to do with the team’s alternate position for the upcoming Global Cup. Two-time World Champion J.B. Mauney’s attempt to ride with a broken leg had not gone well in Oklahoma City or Fort Worth, Texas, and the two were beginning to put together a list of American riders available to them. Who is the best healthy American bull rider not on the Eagles squad that can come through in the clutch with a necessary 88-point ride in the long round on Championship Sunday? McBride and Hart continuously kept asking themselves that question until they finally came to a conclusion. Five-time PRCA champion Sage Kimzey is that guy, they agreed. Therefore, McBride called Kimzey on Sunday to gauge the reigning PRCA champion’s interest. Kimzey was more than happy to accept the opportunity to join the Eagles as their alternate rider for the 2019 WinStar World Casino & Resort PBR Global Cup USA, presented by Monster Energy, on Saturday and Sunday at AT&T Stadium. Fans can stream the Global Cup live on RidePass on Saturday at 7:30 p.m. ET and Sunday at 1:30 p.m. ET. A special highlight show will air on CBS Sports at 12:00 p.m. ET on Sunday. 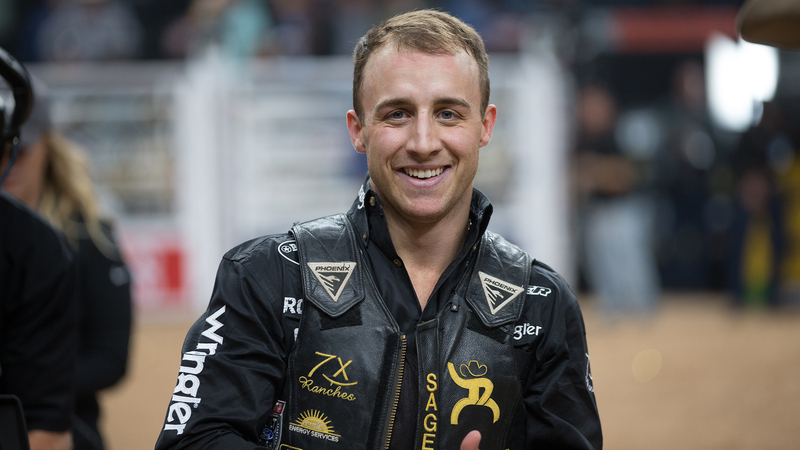 “The Global Cup is an exciting event for a lot of reasons, but I like to consider myself a patriotic guy and, when McBride gave me the call, you don’t get many opportunities as a bull rider to represent Team USA,” Kimzey said. “To do it on one of the biggest stages the sport has to offer is exciting, for sure. I am really thankful for the opportunity. It should be a fun event. McBride and the PBR’s competition department made the official announcement of Kimzey replacing Mauney as the team’s alternate on Monday. The three-time Global Cup coach said he talked with Mauney on Sunday. McBride said the decision is strictly a matter of Mauney’s health. Mauney broke his left fibula two weeks ago when Hou’s Bad News stomped on him following Mauney’s 88-point ride at the Sacramento Invitational. He bucked off both his bulls at the Fort Worth Stock Show & Rodeo last week and both his bulls this weekend at the Express Ranches Invitational as he tried to battle through the injury. There is no immediate timetable for when Mauney is going to return to competition. Mauney is the latest Eagles member to have to miss the event following Matt Triplett’s decision to pull out because of a riding wrist injury. The two injuries left McBride and the Eagles with limited options after he replaced Triplett with Brennon Eldred on Friday. “There are some other guys,” McBride said. “I like (Koal) Livingston. He will be a guy on the team in events to come, but he is not that guy yet. When you start splitting the countries apart, especially when you split the American and Native American teams apart, you start running out of options pretty quick. It goes from Koal to Ezekiel Mitchell. ‘Zeke has started five 87-88 pointers, but he bucked off all five of them at 6 or 7 seconds. Kimzey said he wishes injuries were not the reason for him being added to the team. The Team USA Eagles roster is now 2016 World Champion Cooper Davis, 2017 World Champion Jess Lockwood, 2012 PRCA champion Cody Teel, world No. 4 Chase Outlaw, No. 16 Eldred, No. 19 Cody Nance, No. 21 Derek Kolbaba and Kimzey. Kimzey is 28-for-42 (66.67 percent) in his career at all levels of PBR competition. He qualified for the 2017 PBR World Finals via the 2017 Velocity Tour Finals and went 3-for-6 for a 12th place finish. The 24-year-old also has had some success inside AT&T Stadium. Kimzey won RFD-TV’s THE AMERICAN in 2017 with an 89.5-point ride on Uncle Tink and 85.5 points on Deep Water. 2019 has been a slow start for Kimzey. He is 17th in the PRCA bull riding standings after taking a few weeks off following a dislocated left shoulder (free arm) and dislocated ribs at the 2018 Wrangler National Finals Rodeo. McBride also considered not having an alternate at all, but the PBR competition department informed him it would be an unfair advantage if he had to double up with one of his riders on the final day of competition at the Global Cup. The PBR did let Team USA not have an alternate when they won the inaugural Global Cup in Edmonton. The league also let Team Mexico not have an alternate last June in Sydney. The situation works in Kimzey’s favor, though. Kimzey is more than likely unavailable to ride on Saturday night at the Global Cup because he is competing at the Fort Worth Stock Show & Rodeo on Friday and Saturday afternoon. If he qualifies for the short go, Kimzey would not make it to AT&T Stadium in time for the first night of the Global Cup. But McBride will not need his alternate until Sunday afternoon at the earliest. McBride’s seven riders will compete Saturday night in the long round, and he only needs two of those riders to be healthy for the bonus round later in the evening. Therefore, Kimzey could still try to win Fort Worth before making the 30-minute drive to Arlington Sunday morning for the conclusion of the Global Cup. McBride understands Kimzey has received criticism for not riding in the PBR full time, but that is the least of his concerns. The coach is trying to give the United States its best chance to reclaim global bull riding dominance. “It is not who we like the best or who we like to see a part of it,” McBride said. “It is who do we think gives the team the best chance to win. Right now, at this point, it is Kimzey. He is probably not the most popular guy that will show up there Sunday, but to me that doesn’t matter. I want to see everyone ride for one common goal when it is going on." McBride did add that he was also very appreciative of how open Kimzey was to the situation. Kimzey could have demanded the opportunity to ride and not be the alternate. “I am damn appreciative of him saying he would do it,” McBride said. “He could say, ‘I am not going to do it. I have five gold buckles.’ I damn sure also appreciate how he posed it, saying he hopes he doesn’t have to ride because that mean someone gets hurt. But if he needs to, he will do it.